There is nothing like finding a new comic that grabs your attention. Especially if it's an old comic and you don't have to wait a month for the next issue. 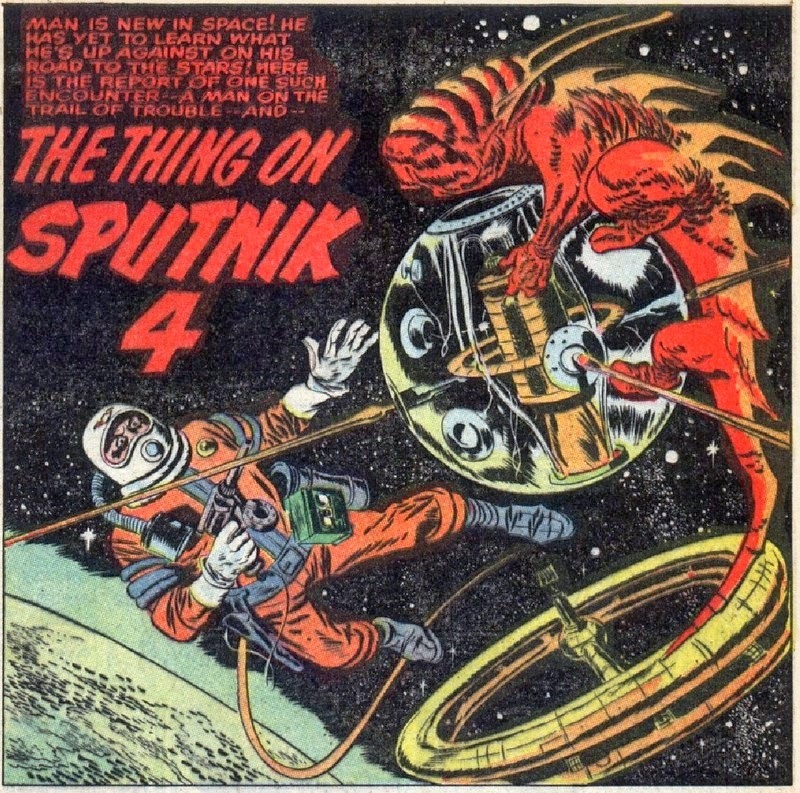 "The Simon & Kirby Library: Science Fiction" is one of those comics. It showcases some of their best "unknown" science fiction stories by Joe Simon and Jack Kirby from the 1940's to the early 60's. The stories include the first 10 issues of the superhero Blue Bolt, a variety of short monster and rocket stories from Alarming Tales and Black Cat Mystic, and then their all-too-short run of Race for the Moon, inspired by the Cold War space race. The past couple of years there have been a lot new nice reprint editions of golden age comics, all of them vying for your comic dollars. For example, I Shall Destroy All The Civilized Planets! about Fletcher Hanks, Spacehawk by Basil Wolverton, and Amazing Mysteries: The Bill Everett Archives (the creator of Namor, the Sub-mariner) all caught my eye (and my wallet!). The first reprint that I saw like this was Supermen! : The First Wave Of Comic Book Heroes 1936-1941 which was sort of disappointing since it failed to include any extras to set the context for the stories. Although it had a nice foreward by Jonathan Lethem, the stories themselves felt as if they existed in a vacuum. The omission of context is even more disappointing given that many of these books are available as public domain scans. Public domain sites are supported by collectors who have scanned their copies and uploaded them for sharing. The sites are supported by donations or advertising. Perhaps the best thing about the public domain sites is that they allow access to material that was previously limited only to a few collectors. For example, earlier this year I found Kirby in Alarming Tales #1 on a public domain site. the same story downloaded from a public domain site and read on an iPad. 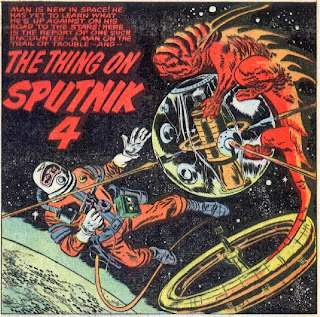 It wasn't until I started reading "The Simon & Kirby Library: Science Fiction" that I realized Kirby had art in the first six issues of Alarming Tales, as well as in Black Cat and Race for the Moon. Since the editors had compiled the stories across a slice of comics, they exposed the lesser-known works, providing a new insight into the works of both Joe Simon and Jack Kirby. Still, the book left me wanting. The foreward by Dave Gibbons is inspiring, but it arrives from a fan's point of view. I'd like something more... a timeline or an behind-the-scenes an interview? Bits of this are included in the book: an unpublished two-page spread from a 1940's Captain America story is presented beside a re-worked version that appeared in "Win a Prize" comics. There's also a description of a couple pet projects that Joe Simon shopped around in the 60's, 80's, and later coupled with sketches by Kirby. But I have to compare these reprints to a DVD boxed set with extras! Most Criterion editions of movies have at least one audio commentary, along with trailers, interviews, biographies and documentaries. I'd like to see the editors stretch to include these with the reprints. For example, a time line showing how Kirby was concurrently drawing Young Romance, Black Cat and Quick Trigger Western would be very interesting. It would remind you that Joe Simon, the creator of Blue Bolt, Captain America, The Boy Commandos, and the Fighting American, didn't get much money from his creations, but still had a wealth of creativity. A different "Thing". From Race For The Moon #2. In the meantime, I'll appreciate this volume of Kirby & Simon stories and art. The editors have done a good job of collecting the important stories and presenting them together to show the breadth of imagination this team was capable of. I hope that a portion of the money from these books goes to the estates or family of Simon & Kirby. I'm looking forward to more Kirby & Simon reprint collections.